For those of you who are in the Windows Insider program and are testing the beta of Windows 10, you now can trial the new touch-friendly Office for Windows 10 apps. The new Word, Excel and PowerPoint are all available in the Windows 10 preview in the Store beta. This is great news as Microsoft is rapidly pushing out many of the key changes and updates they announced at the Windows 10 event a few weeks ago. Office for Windows 10 is one of those key announcements with Windows 10 for Phone being the only major one left to be seen. 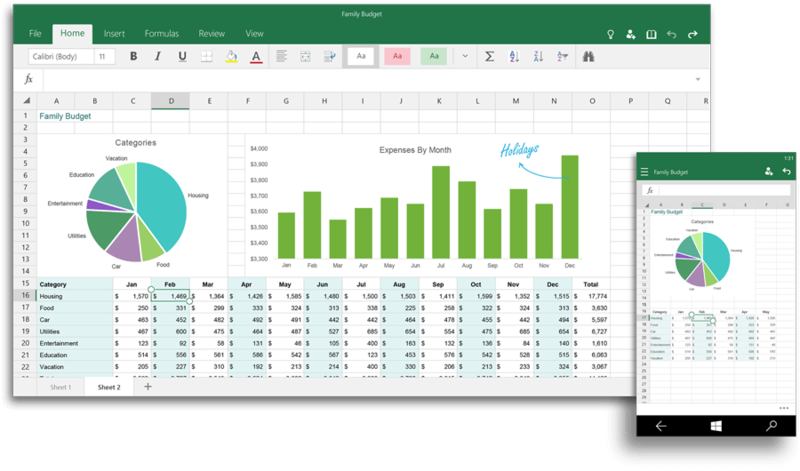 Office for Windows 10 offers touch-optimized versions of Word, Excel, PowerPoint, OneNote and Outlook that work great on small screen devices like your phone and tablet—all the way up to the Microsoft Surface Hub. They are designed from the ground up to run on Windows 10, built for touch and offer the unmistakable Office experience you know and love. As “universal” Office apps, they truly are the same app across device size, providing a consistent way for independent software vendors and developers to extend and integrate with Office apps. These new Office apps will be pre-installed for free on phones and small tablets running Windows 10, and available to download from the Windows Store for other devices. The Office universal apps will be available with the Windows 10 Technical Preview in the coming weeks and general availability is on track for later this year. Interestingly, as you view the screen captures that are in this post, they clearly show both the Windows 10 desktop/tablet view as well as the view of the apps on a Phone. This is exciting as it will truly be universal and the same experience no matter which device you are using – exactly what Microsoft said it would be. The post also mentions that Office 2016 in the works and will be out later this year. To get these new Office for Windows 10 apps, you will need to be running the Windows 10 preview and will have to get them through the Windows Store beta within Windows 10. Also keep in mind that these are beta so you can expect to see the occasional bug or issue with it, just like you can with Windows 10 right now.